...And that's a very good thing, feels Sukanya Verma. Black Panther doesn't have the manner of a regular superhero vehicle. It's the first thing you notice and love about the latest Marvel comic book character to get a solo movie and his insistence to be more than a swanky suit and supreme strength. Over the years, we've been conditioned to believe superhero films are only about Caucasians saving the world and striving for higher ideals. But the Ryan Coogler-directed joyride is as much about launching an underrepresented race into the mainstream seamlessly and complexly as much as it's about redefining the rules of entertainment. 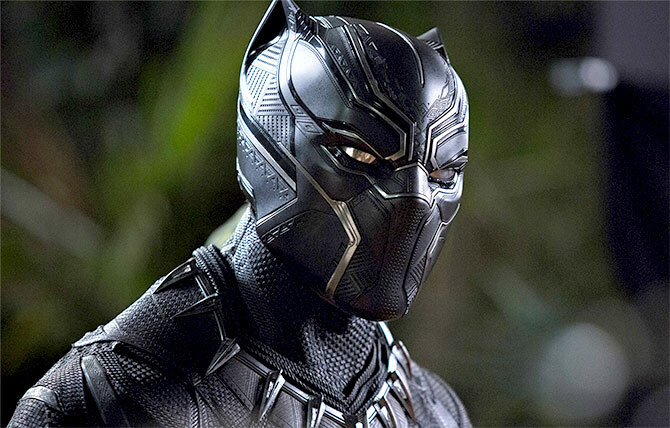 The African Diaspora comes alive in its robustly designed, costume-lavish, spectacle-ready frame of Black Panther whose story is rooted in the ancient realm of Wakanda. Rich in vibranium, the formidable metal (and the secret of Captain America's indestructible shield) its proud, industrious people have cultivated and wielded to create a self-sustained centre of path-breaking technology, Wakanda assiduously maintains a Third World front to deflect unwanted attention from trespassers and troublemakers. Following the demise of its king in a bomb explosion of Vienna -- documented in Captain America: Civil War -- Wakanda is gearing up for the coronation of his son and successor, T'Challa (Chadwick Boseman, smouldering, seductive, sinewy). Dazzling, dizzying activity unfolds in its effervescent rituals and ceremonial combats against the backdrop of magnificent waterfalls, as the man of the hour emerges victorious despite great odds and stakes his claim to worthiness. But for all his decorated significance and dilemmas about to be or not to be, it's the women who protect and assist him at every turn -- guiding mother (Angela Bassett), gizmo-friendly sister (Letitia Wright), feisty general (Danai Gurira) and gritty ex (Lupita Nyong'o) -- that elevate Black Panther's mesmerising disposition into a mind-blowing one. Basset's commanding charisma does its job from the sidelines while the cheeky Wright, reminiscent of a young Winnie Paranjpe (remember her in Katha? ), brings in unexpected adorability to the nearly forgotten sibling equation. Nyong'o is the picture of effortless feminism whereas Gurira's blustering swagger demands a cinematic platform of its own. It wouldn't be unrealistic to say that the women of Wakanda and not vibranium as its greatest asset and in an alternate universe, they'd be ruling the universe probably with the warriors of Amazon (look up Wonder Woman) by their side. Black Panther has tons more revolution on its mind -- for black lives, for Hollywood, for comic book universes. It's an eventful screenplay and a supremely engrossing one. The director of Fruitvale Station and Creed marries indie punch with blockbuster bluster to throw up a Bond-like enthralling car chase in the splashily lit-up streets of Busan, a late night rescue operation in the shadowy jungles of Nigeria, a surreal dream starring tree-bound panthers, northern lights-inspired skies in the psychedelic vein of Alice in Wonderland and an unfortunate family dispute that harks all the way back to 1992 in Oakland, America. Under Coogler's direction, T'Challa must contend with the conventional face of villainy (trust Andy Serkis to have a blast even when a caricature) as well as confront an adversary (more power to Michael B Jordan) backed by valid reason. What lends these conflicts authenticity and individuality is Coogler's refusal to pick sides or resolve the matter of identity, entitlement and privilege in context of African and African American conclusively. Somewhere, the ethnic overture in Black Panther is so deliberate and overpowering, it makes the presence of Serkis and his Hobbit co-star Martin Freeman seem like forced inclusions.